Nicole Y. Männl (Hanover, Germany) started interacting with the internet 1996 in communities and newsgroups. Today one would say “this Social Media Thing of the 90s”, twittering since 2007. Selfemployed with Webdesign + Social Web-Consulting + starting the Blog in 2007. A 110% geekgirl because technics and gadgets are most important, cannot live offline – without her iPhone, Netbook and flipcam. 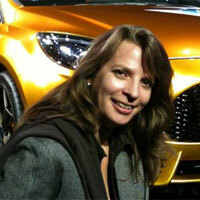 Addicted to Cars – especially E-Cars – there are more and more articles about on her blog. Nicole drove as the first and only female pilot the premiere E-Car Rallye Silvretta in a Honda Fuel Cell, a few month later participating at the “e-miglia” in an e-smart, always blogging about. Invitations to test drives and motor shows are always welcome – the reports – with her matchless special style to talk about cars – are on her blog with photos and videos. Nicole is moderating the “Webmonday Hanover” (since March 2007) and organized the “Barcamp Hannover” in 2008. The newest project in October 2010 was to initiate a usergroup named “WP Blogger Hannover”, where the bloggers are talking and sharing all about blogging (social + technical). Obvious to blog about this activities, too!